Carolina Marin overhauled a brave Pusarla Sindhu in the women's singles final on Friday to win Spain's first badminton title and crush India's hopes of a maiden gold medal in the discipline at the Rio Olympics. 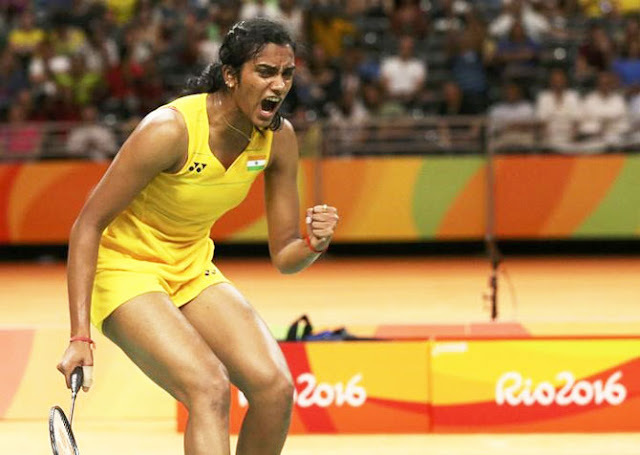 The top seed, known as the 'Rafael Nadal' of badminton in Spain for her tenacity and fierce left-handed game, closed out a 19-21, 21-12, 21-15 victory over the 21-year-old Sindhu, who was majestic in her Olympic debut. Letting out a blood-curdling shriek with every winning point, the Spaniard was jeered by spectators at the Riocentro in the nerve-shredding final as she pushed the rules of good sportsmanship with constant stalling tactics. But the ruthless 23-year-old got the job done, charging away to grab six match-points and sealing it on the second with an imperious smash down the line that her opponent did well to get a racquet to. Flag-waving Spanish fans jumped up and down in the terraces as twice World champion Marin pumped her fists and bellowed in triumph, having survived a huge scare. Roared to the finish by Indian fans, Sindhu will bow out with huge acclaim, having clinched the country's second and highest medal at these Games, four years after compatriot Saina Nehwal grabbed the nation a bronze in the same event in London. Japan's Nozomi Okuhara won the bronze in a walkover after her Chinese opponent, the 2012 singles champion Li Xuerui, pulled out of their play-off with a serious knee injury.